The Mindset concept developed by psychologist Carol Dweck proposes that self-perceptions in one's learning potential determines an individuals capacity for learning new skills, abilities, and talents. 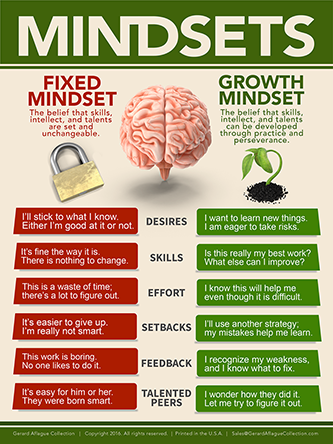 Dweck proposes the extreme spectrums between a fixed vs growth mindset. Our beautifully designed poster illustration offers insight into the contrasting of perceptions of these two mindset types. It also provides students an opportunity to understand how their beliefs shape their capacity for learning and future growth as well as success. Growth Mindset is an educational theory that many teachers embrace as part of their teaching arsenal. Teaching a growth mindset helps to strengthen children's perceptions and beliefs as they grow and understand their world and learning capacities. Our poster is a great tool that works to identify thinking strategies in the areas of desires, skills, abilities, efforts, setbacks, feedback, and how to perceive talented peers. Over the course of time, use this poster to employ thinking strategies with students and help them to discover their potential. Special note: To mount this poster in a frame, please ensure that the framed glass has a viewable area of 18x24 inches.